In this supremely creepy story from horror master H.P. 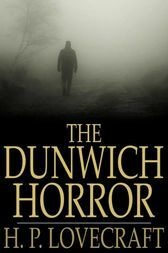 Lovecraft, an unspeakable horror is unleashed upon the quaint burg of Dunwich, Massachusetts in the form of a young boy named Wilbur Whateley, the son of a disfigured albino woman and a mysterious -- and possibly demonic -- father. Wilbur's birth ushers in a series of strange events in the town that only intensify as he grows older. Will the townspeople be able to contain this curse before it's too late?